Unfortunately, we have many examples of countries that were oil exporters, but are dealing with collapse situations. Egypt, Syria, and Yemen all have had political disruptions since 2011. These may not be called financial collapse, but they all took place as the country’s oil exports decreased and as the price of imported food rose. Another example is the Former Soviet Union (FSU). It collapsed in 1991, after a period of low oil prices, in what looks very much like a financial collapse. Oil exporters are often dependent on oil export revenue to fund government programs. The need for government programs grows as population grows and as the price of food rises. The amount of oil that can be extracted in a given year often declines over time, as initial stores are depleted. Exports often decline even more rapidly than oil supply, because of rising oil consumption as population grows. In general, high oil prices are good for oil exporters (except the effect on food prices). At the same time, oil importers strongly prefer low oil prices. As a result, we end up with a price tug of war between oil importers and oil exporters. One additional issue is declining Energy Return on Energy Invested. Countries often have the option of reducing their rate of decline by adding production in areas which are more expensive to drill (say deeper, smaller locations offshore Norway) or by using enhanced oil recovery methods. Such approaches add costs (and energy use), and further add to the price that oil exporters need for their product. Egypt, Syria, and Yemen are three countries that the press would say are suffering from the continuing impact of the Arab Spring revolutions, which began in 2011, or of civil war. 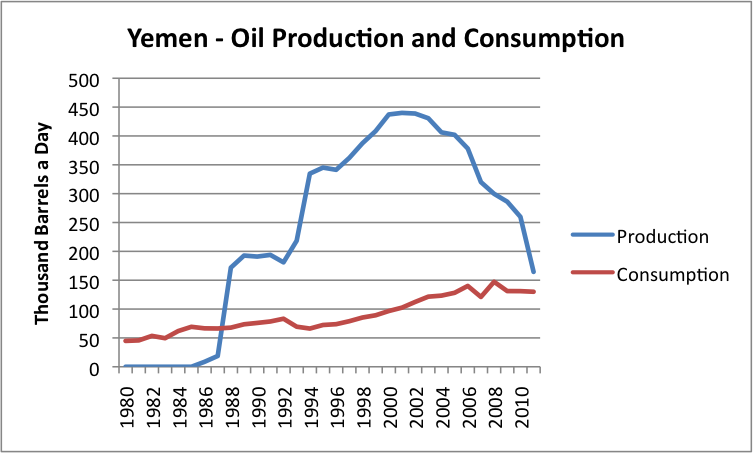 The similarity of the oil production and consumption charts for the three countries (shown below) suggests that declining oil exports likely played a major role as well. In all three countries, oil production rose and then began to fall (Figures 1, 2, and 3). At the same time, oil consumption rose. The two lines–production and consumption–come very close to meeting in 2011, indicating that oil exports are at that point dropping to 0. FIgure 2. 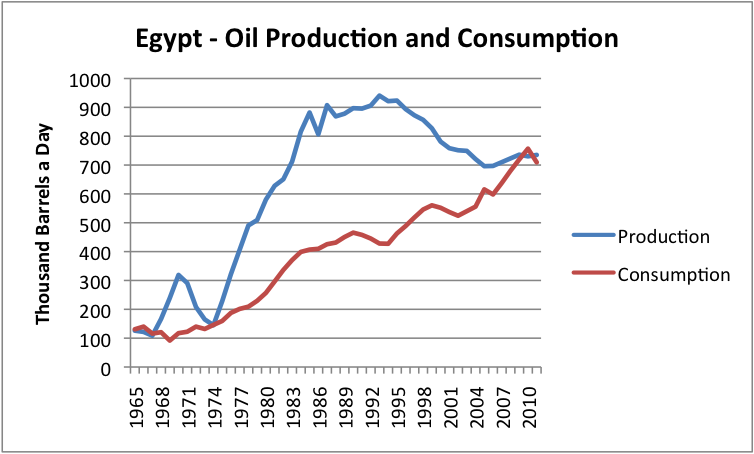 Oil production and consumption for Egypt, based on BP’s 2012 Statistical Review of World Energy. To make matters worse, the three countries are in an arid part of the world, where a large share of food must be imported. 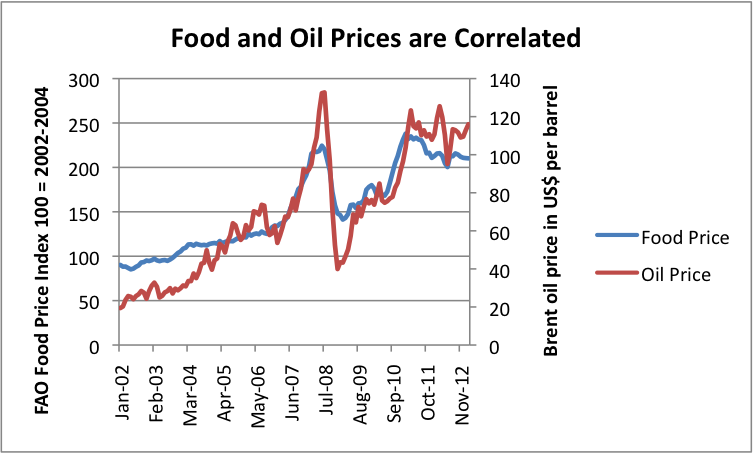 Oil prices and food prices tend to rise at the same time (Figure 4, below). By 2011, both food and oil prices were high. In fact, both prices have tended to stay high. Now, these countries find themselves with the unpleasant problem of paying for the higher cost of imported food (grown and transported with oil), so indirectly they are becoming an oil importer instead of an oil exporter. Figure 4. Food and oil prices tend to rise at the same time. Based on data of the FAO and the EIA. Faced with less revenue from oil exports, and higher prices of food imports, these countries find themselves with a permanent mismatch between revenue and expenses. Part of the revenue mismatch relates to subsidies offered to poor residents. With higher food and oil prices, the funding needed for subsidies rises rapidly, even as oil exports drop to close to zero. One issue that makes the situation worse is the huge rise in population that came with increased prosperity. 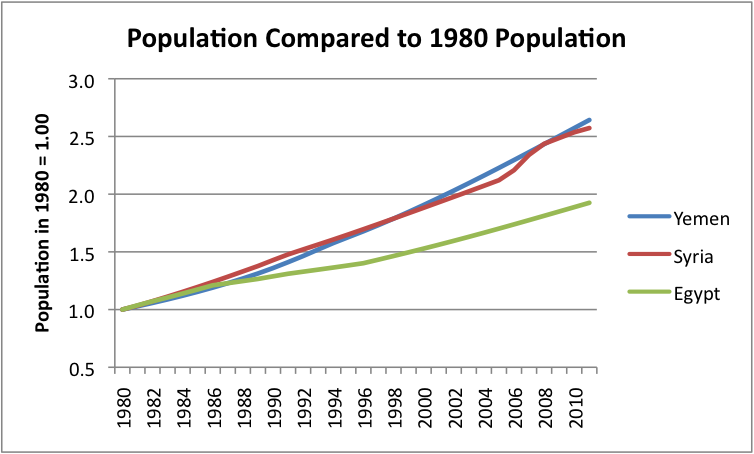 Population has nearly doubled since 1980 in Egypt, and has more than doubled in both Syria and Yemen (Figure 5, below). Figure 5. Ratio of population in later years to population in 1980, based on EIA data. I tried to put together an index of the relative dependence of various countries on oil exports, by comparing the value of oil exports to Gross National Income. Based on exports before the recent drop-off, Yemen’s index is around 30%; Syria and Egypt are a little under 10%. The index no doubt understates the role of oil, because it does not include the oil the country uses itself, or the impact of any natural gas industry. It also excludes indirect jobs, like that of grocery store owner or taxi driver. If Egypt and Syria are indeed collapsing with what seems like low dependence on oil exports, it makes one wonder about the impact if Saudi Arabia’s (index over 70%) or Libya’s (index about 60%) oil extraction would drop. 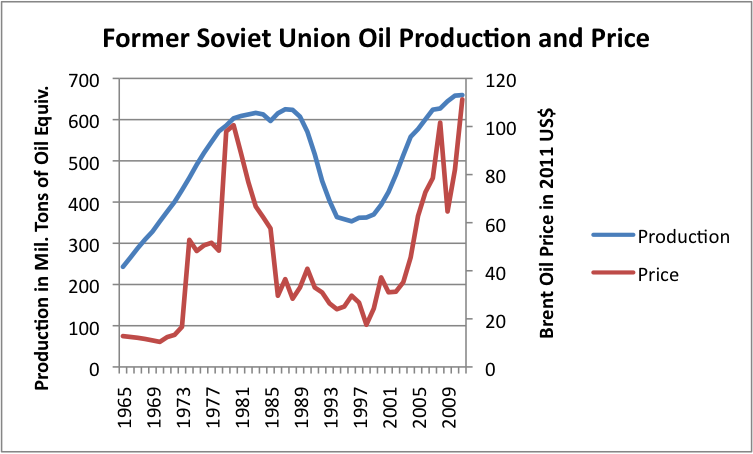 The Soviet Union was an oil exporter and a major world power, prior to its collapse in 1991. While there are many views as to what led to this collapse, one issue seems to be a drop in oil price in the early 1980s. Figure 6. Former Soviet Union oil production and price in 2011$, based on data from BP’s 2012 Statistical Review of World Energy. The drop in oil prices did not lead to an immediate decline in oil production (Figure 6), most likely because the cost of maintaining production on a field that has recently developed, is low for a few years. What is expensive is the up-front cost of bringing new fields on line. These were not added, causing a decline in production, after a few years. Russia’s energy data shows the marks of the financial collapse building, prior to 1991. Revenue from oil exports dropped in the mid 1980s, because of the lower oil price. 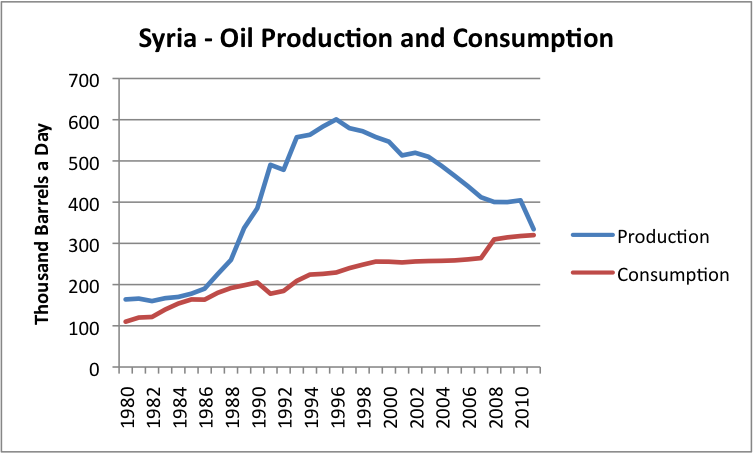 Oil production started declining in 1987, four years before the collapse. Other types of energy production started declining as well, as if a recession were underway, pulling the economy down in all areas. Figure 7. Former Soviet Union Energy production by type (hydroelectric omitted), based on BP’s 2012 Statistical Review of World Energy. Every type of energy production (except hydropower, not shown) dropped back during this period, even coal and nuclear, with decreases beginning prior to 1991. Population growth started slowing prior to 1991 as well. Eventually, the government collapsed, after continuing recession. Figure 8. 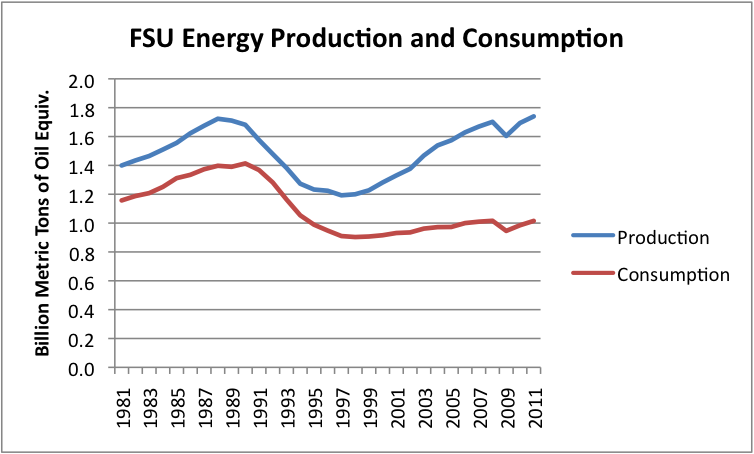 Former Soviet Union energy production and consumption, based on BP’s 2012 Statistical Review of World Energy. 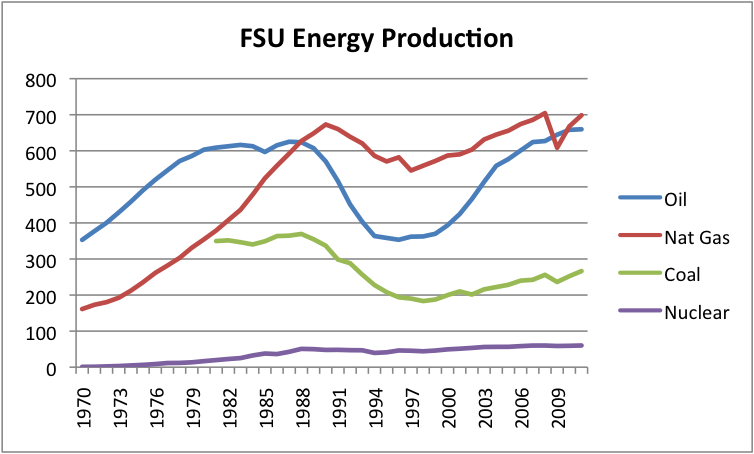 The FSU never regained its former stature as a manufacturing country, even when oil production rose, after oil prices rebounded. With little manufacturing, energy consumption has remained far below its pre-1991 levels (Figure 8). I visited Russia in 2012, and saw for myself a little of the current situation. One problem is that its cost structure (based primarily on oil and gas which is now high-priced, and workers who need wages to pay for these fuels) is not competitive with the low-cost structure of the Chinese and Indians. Another issue is the poor condition of Russia’s infrastructure (roads, bridges, water pipelines, etc.) due to neglect during the time of its collapse. With the high cost of oil, it is expensive to make repairs and add new infrastructure. In terms of my index, Russia’s oil exports now amount to a little less than 20% of Gross National Income. Egypt, Syria, and Yemen are examples of countries whose exports have pretty much disappeared, causing great crisis. But how about countries with earlier declines in production? To some extent, there were not many problems in the 2003 to 2008 period, because declines in oil exports could often be offset by increases in oil prices. One country that stands out, though, is Argentina, with problems both before and after the 2003-2008 period. Figure 9. Oil and Gas Production of Argentina, based on EIA data (total liquids). Argentina’s oil production hit a peak in 1998, and began dropping in 1999. Oil prices were at an unusually low level in the 1998 to 2002 period. This timing coincided precisely with it first economic crisis, which came in 1999 to 2002. 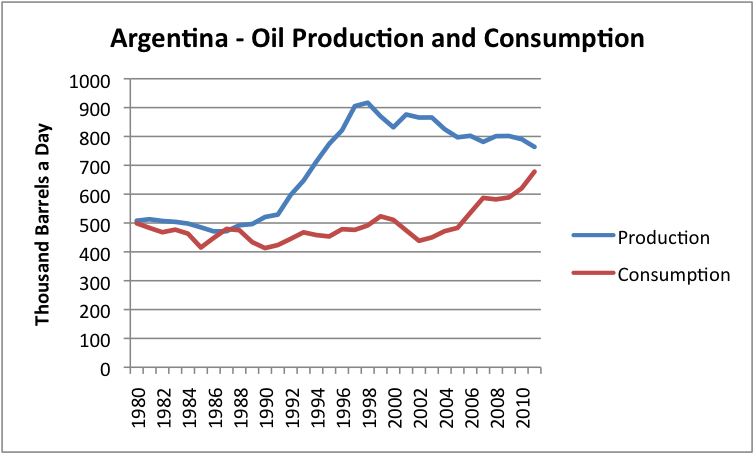 Oil prices rose in the 2003 to 2008 period, and Argentina’s problems seemed to disappear. Now Argentina’s oil exports are very low, and in 2012 and 2013, the country is again having financial problems. Argentina’s economy is well diversified, so a person wouldn’t think that oil would play a big role. (My index of the role of oil exports was only about 2%, as of 2008.) But oil problems overlay any other problems a country may have. If a country has a tendency to overspend its income, or over-promise subsidies, any reduction in oil income will tend to magnify this effect. When making plans, it is easy to overlook the fact that the benefit from oil income is temporary. Many large oil exporters include revenue from oil exports in a country’s annual budget. This is quite different from the cost of pulling the oil out of the ground. It is the money governments collect, as taxes or revenue sharing agreements or leases, to support their programs. With rising population, and often with declining exports, oil exporters find that they need higher prices each year, just to make their budgets balance. Figure 10 provides some Deutche Bank estimates of budget break-even oil prices. FIgure 10. 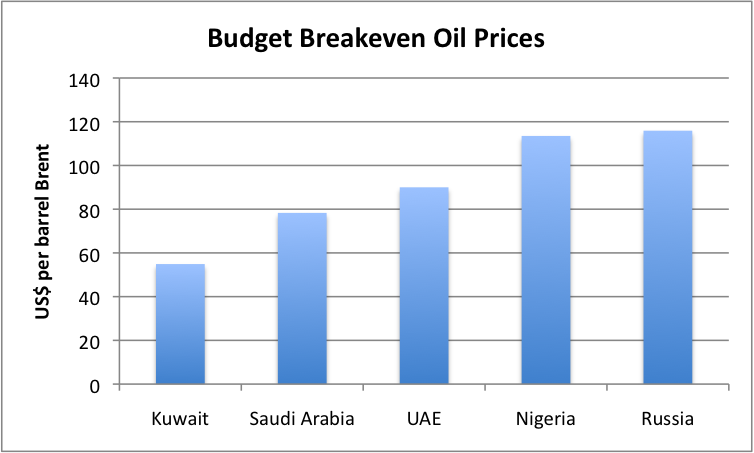 Budget breakeven oil prices, based on a Deutche Bank analysis provided in a presentation by Mark Lewis. Note that the indicated break-even prices for Nigeria and Russia are above current Brent price levels. (The current Brent Crude oil price is $106.) An estimate from Energy Policy Information Center (EPIC) shows Venezuela’s break-even price to be a little higher than Russia’s, and Iran’s between that of Nigeria and Russia. According to EPIC, Iraq’s break-even is in the $80 to $100 barrel range. The Saudi Arabian oil minister was quoted on January 16, 2013 as saying that the country needs oil prices averaging $100 barrel. One concern is that these break-even prices will keep rising. Another concern is that countries “at the margin” will find it difficult to reach their price targets. One country of concern is Venezuela. It has a very high break-even price, and recently underwent a leadership change. It also has a tendency to spend oil revenue, even before the oil is pulled from the ground, through loan programs from the Chinese. Figure 11. 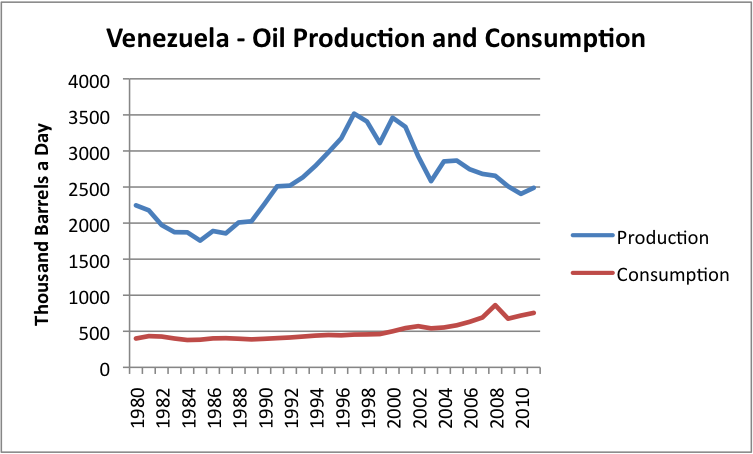 Oil production and consumption of Venezuela, based on data of the EIA. Venezuela’s exports are lower than in some previous years (Figure 11, above), but with the rise in the price per barrel, the dollar value has perhaps risen–this really depends on the price negotiated by China. With funds spent before the oil is produced, Venezuela can easily get itself into a trap, if “regular” oil production drops, or if it is difficult to ramp up new planned production. Venezuela’s oil export index is about 20%, which is similar to Russia’s and Norway’s. In general, oil exporters with declining oil production face worrisome situations. Reduced oil exports present a drag on the economy unless oil prices are rising rapidly. If oil prices do not keep rising rapidly, oil exporters will need to cut back on social programs–something that will not be well-accepted by citizens. Furthermore, adding new industries to take the place of missing oil supply may be difficult. There may even be a reduction in oil supply available to world market, if civil disorder causes a loss of production which would otherwise reach the export market. This entry was posted in Financial Implications and tagged Egypt, financial collapse, Former Soviet Union, oil exports, oil price, Syria, Venezuela, Yemen. Bookmark the permalink. Similarly, there was a recent report about Europe having to close a refinery a year (as I recall) to adjust to lower demand. Look at the decline in refinery products in the US and then see if you can figure out why the big bucks in the petroleum industry are so interested in refining tar sands on the Gulf? Assuming that the final chart represents the real world of auto fuel consumption (i.e., falling off the cliff), then that has a lot of repercussions. For example, state gasoline revenues which are derived by taxes on gallons sold are yielding less revenue and so maintenance budgets are squeezed and the states are looking to broaden the tax. For example, special taxes on ‘high mileage’ vehicles. In my state, the Dept of Transportation is fairly generous about building bike lanes in our college town. As things get tougher, I expect more blowback from the auto lobby. And suppose you were an intelligent President of the US and wanted to do some public works to ‘stimulate the economy’. Would you build more roads and bridges? Suppose you were a resident of Pennsylvania and the engineering profession had just published a study which claimed that hundreds of millions needed to be spent on roads and bridges. What would be your reaction as a taxpayer? I am sure there are many intricate relationships which have evolved over the last 65 years, especially, which will need to be unwound. And anytime anything needs to be unwound in politics, it is painful as the well-funded special interests go to work with mercenary legislators. One more thought. When I became aware of Peak Oil, everyone talked about production. Peak Production was on everyone’s mind and was the principle concern. I certainly never thought that Peak Consumption of Oil was the problem, or that, in the OECD countries, we could experience Peak Consumption while global oil production was either flat or increasing slightly. Yet the Zero Hedge charts strongly suggest to me that that is exactly what has happened. Yet one more thought. So the real problem for any family, or business, or country is Peak Consumption. That is, when their ability to purchase petroleum products is curtailed and they can no longer use those products to generate economic activity. And it stands to reason that the most efficient families, businesses, and countries will be able to afford petroleum products long after the relatively inefficient families, businesses, and countries have fallen into economic contraction. In fact, it is probably just a question of time until the inefficient families, businesses, and countries enter a death spiral. You frequently mention efficiency…recently in terms of the gross inefficiency of the US Sickcare Industry. Charles Hugh Smith makes even more pointed comments about inefficiency. 1. The global price of petroleum has increased and will probably continue to increase. 2. Many of the OECD countries use petroleum to support inefficient economic activity (such as Sickcare and McMansions and food waste). I would argue that no single country can do very much about the supply of global petroleum (and it might not be a smart thing in view of Climate Change). Therefore, eliminating economic inefficiencies from the economy is Priority One. These inefficiencies are not limited to the engineering efficiency with which petroleum is used, but also to the choice of activities which the petroleum enables. We are indeed reaching peak consumption. Peak consumption comes because people cannot afford to buy cars or gasoline for their cars. We (the United States, most of Europe, and Japan) are in fact, in the first stages of financial collapse. Fewer and fewer people have jobs, indirectly because of high oil prices. When people don’t have jobs, they can’t afford cars, and they don’t drive as much. I tried to talk a little about this in Why is Oil Consumption Lower-Better Mileage. It is not clear that China, India, and the rest of the world will collapse at the same the United States, Japan, and most of Europe. Thus peak oil consumption may not be here yet for these areas. But if they can get rid of the demand from the US, Europe, and Japan, there will be that much more for them. I need to write a post related to this. Good work Gail: grim picture. of UK disposable income that seems to mirror North Sea Oil production. Now I know just because something ‘looks’ like something doesn’t mean there is anything in it. But I would be interested to have a professional opinion. It means the UK is basket case just as much Egypt. And the success of new labour was perhaps due to the last bit of oil and gas wealth. And she didn’t have to take on the miners, a little patience and the UK’s 300 years of coal reduced 99% over night in 1999. A local ish mine was bought out by the miners- Tower Colliery, it did quite well but they hit geology problems and closed a few years. Makes you wonder about the rest of the 100 years of coal around the rest of world. Ding dong the witch is dead- I wonder how many people can be asked to keep to their promise of dancing on her grave? Is there no consideration of economic diversification in these assessments? Does the UK produce and/or sell anything to neighbors? Anything means exactly that. Does the UK (or France or Spain or any other country on whatever continent) have the ability to increase its exports? Germany has done a very good job of increasing its exports; the Mittelstand system appears far superior to most other methods. But that’s just one persons’s opinion. One of the fun aspects about Parkinson applications is that they invariably make the case for smaller government. 30 years ago we used to propose that all the federal government workers line up on the Mall in Washington DC and count of by two/s: “one, two, one, two”. When they finished, the announcement would be made: “One’s go back to work, two’s go home and find another job.” All believed the federal government would get just fine. Economic diversification works best when you have cheap energy to use. If the only energy you have is expensive energy (or human energy, which is very, very expensive), the products you make are very expensive compared to those made in countries that still have cheap energy. As long as coal is fairly cheap, countries that use it will have a big advantage competitively. Countries that don’t need much energy for heating homes and commuting to work will also be ahead competitively. Thus, “warm” countries will be ahead, especially if their workforce mostly walks or bicycles to work (or lives on site). this is why civilisations kicked off in that northern landmass which supplied enough natural warmth so that humans didnt have to expend all their energy providing it for themselves. You are right about the tropic of Cancer running through the old civilizations. We in the colder areas have a huge disadvantage relative to warmer areas, when energy costs are high. We can’t compete if economies have to shrink back to a more sustainable level, which means a lot less heat for homes, and people walking outside to get place. Atlanta in the US where I live has a fairly temperate climate. It would almost be possible to get along without either heating or cooling. It would be nice to think that the oil industry in the UK is small enough relative to disposable income that the drop wouldn’t be a problem. Part of the roblem, though, is that natural gas is dropping as well. Substitutes (like offshore wind) are much higher priced. And of course the UK’s big financial industry depends on economic growth. If the growth isn’t there, the financial industry start to implode. The Eurozone is the group who don’t have oil in the first place. There was a recent announcement that the Eurozone unemployment rate hit 12%. Used judiciously and invested wisely the remaining oil can be put to work now to help transition to another way of living. Are we all saying things are going to crumble in the next decade and there will be no oil? Doubtful. If the oil is there and the tools are there to extract it then what do we really need? Money. Money is an abstract thing that pays for labour and replacement parts and is valuable to the seller of these things in that he can use that money to buy things he needs. Doesn’t seem complicated. Resources are finite sure but the real problem here is money and debt. The current paradigm doesn’t allow govt to issue the money needed. Governments can and do print money. The issue with oil declining is that money no longer serves as a store of value. Or perhaps, inflation as well as political disruptions are constant problems. It will be harder to trade among countries, if stability is so low that it is hard to make contracts that last a year or two–order big goods in advance, for example. Countries like Greece and Syria will be in poor condition to pay for goods, if all they have is the money their government has issued. Selling prices would have to be very high, before sellers would take a risk that the money could really be used to buy something. Countries in better shape are likely to trade among themselves. Governments can also employ e.g. a carbon tax and redirect funds into windmills and solar to create renewable alternative energy sources. They can also for example add a serious weight tax on vehicles so that people don’t buy big fat SUV’s but instead buy small energy efficient cars. If you hurt people in their wallets they seem to act. Telling them that what they are doing is wrong does generally not work. But as long as the big corporates are buying their candidates for office, there is really nothing you can do but watch it all collapse – as its no longer the will of the people thats in power but the will of a minority of rich people wanting to make sure they still make heaps of money. Until people wake up to this odd idea of “democracy” I am afraid you just have to take it until it all collapses. A country can first start with a rule that says that any political party’s campaign is governmentally funded with an equal amount of money. Furthermore, all levels of government need open internet searchable transparency so that whenever Big Oil puts money into a politicians account – its visible for all (although much of the money can be indirectly given through other ways – which also has to be detected and clearly shown to the public). Transparency is everything. People need to see what is really deciding the politics. Ahh, rent seeking in a pure form, with supporters. Wouldn’t it be great to so easily identify all the other rent seekers out there in government and industry?